Health, happiness, and wisdom; these have long been the boasts of tea in the East. However, tea is gradually finding fame worldwide as more and more people are experiencing the benefits and great taste of this refreshing beverage. Tea has been used in alternative medicine for centuries to treat everything from inflammation to digestive issues. Modern research has validated these claims, proving that tea is rich in polyphenols and phytochemicals, which can slow the growth of some types of cancerous cells and protect the body from free radical damage. While researchers have been unable to answer a lot of questions regarding this versatile beverage, such as how much tea we should drink to enjoy its full range of benefits, most nutritionists agree that any tea provides many benefits for the average drinker. Boost in Endurance: Researchers have found that the antioxidants in tea increase the body's ability to convert stored fat into fuel, which may improve exercise endurance. Hydration: Although tea contains varying amounts of caffeine, it is still effective in providing hydration for the body. Protection from UV Rays: While it's no substitution for sunscreen, green tea may provide an extra layer of protection against harmful ultraviolet rays. Weight Control: Several studies have shown that those who regularly drink tea maintain a smaller waist circumference and a lower BMI than participants who did not drink tea. Researchers believe that regular tea consumption prevents metabolic disorders that may contribute to weight gain. Immune System Support: Recent studies have suggested that drinking tea regularly may help the body's immune system in fighting off infection. A small study comparing the immune system activity of tea and coffee drinkers showed that those who drank tea experienced a boost in immune system function. Why is Tea Growing in Popularity? While coffee has been a staple for many Americans for countless years, tea has been rapidly catching up as scientists and the public learn more about its many health benefits. According to the U.S. Tea Association, the market for tea has quadrupled in the last fifteen years. Today, more than half of Americans drink tea on a daily basis. Consumers aren’t just reaching for tea bags or tea leaves – they’re also looking for ready-to-drink tea. The U.S. Tea Association also reports that tea has grown more than 15 fold in the last ten years. And “in 2014, ready-to-drink [tea] sales were conservatively estimated to be more than $5.2 billion.” The Washington Post reports, “The U.S. market for tea has more than quadrupled during the past twenty-plus years… By weight, Americans now drink almost 20 percent more [tea] than they did back in 2000.” This industry is rapidly growing and doesn’t seem to be slowing down anytime soon. More and more, tea is being seen as a healthy alternative to other flavored beverages. For those who are new to the world of this versatile brewed beverage, it can be surprising to learn how many different types of tea are available. With so many options, there is sure to be something for everyone. Regardless of its type, all tea is yielded from the same plant, the Camellia sinensis. However, there are differences in the harvesting and processing of the tea leaves, providing us with several different kinds of tea. The most popular types of tea include black tea, green tea, and white tea. Black tea is made from the fermented leaves of the Camellia sinensis plant. It has the highest level of caffeine and is commonly used as a base for popular flavored teas, including chai, as well as many instant teas. Modern research has demonstrated that black tea may neutralize some of the damage caused by environmental pollutants, and may also lower the risk of stroke in regular drinkers. Another popular choice among tea drinkers, green tea is made from steamed tea leaves. It has a high concentration of antioxidants and is believed to inhibit the growth of many types of cancer. It may also improve health by reducing the risk of stroke, preventing neurological disorders, and improving cholesterol levels. Recent years have seen white tea growing in popularity due to its light and mild taste. This type of tea is uncured and unfermented, and has the most potent cancer-preventing properties compared to its more processed counterparts. There are a wide variety of tea options available on the market today, making it easy for anyone to take advantage of its many benefits. Lipton offers a variety of black, green, and white tea, as well as many herbal options. 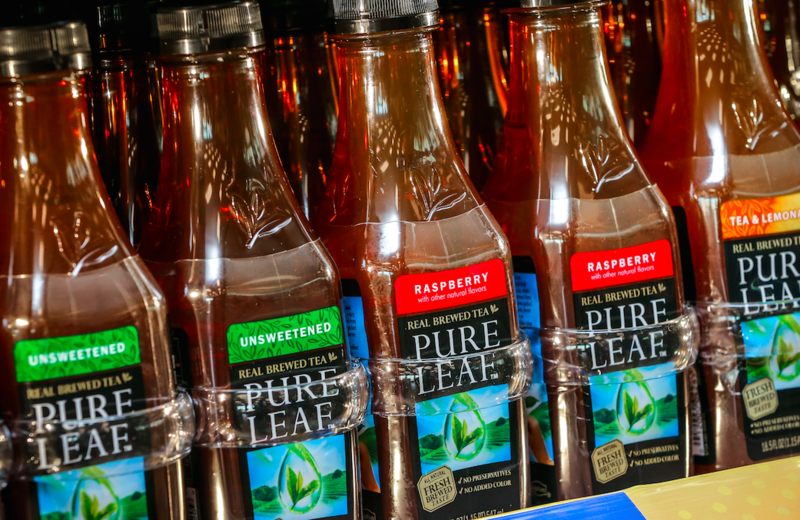 With a selection that includes concentrated liquids, K-cup packs, mixes, sparkling tea, iced tea, and traditional tea bags, it has never been more convenient to offer the delicious taste and healthy benefits of this refreshing beverage.